I was at Corpus Christi College in Cambridge on monday for a symposium called ‘The Alchemical Landscape‘. It was a long and stimulating day of presentations by 14 academics, artists, musicians and writers, and throughout the day themes started to emerge, areas of commonality became clear. Everyone seemed to be playing with the idea of mythmaking in one way or another – and ‘playing’ seems the right word: whether talking about synchronicities, making crop circles, imagining the shoreline as the dividing line between the conscious mind and the unconscious, with the beach detritis to be interpreted as messages, the identification of folksingers like Shirley Collins with the landscape and with the characters in the traditional songs set in it, or daemonic reality, humour was always there, lurking below the surface and occasionally bubbling up. 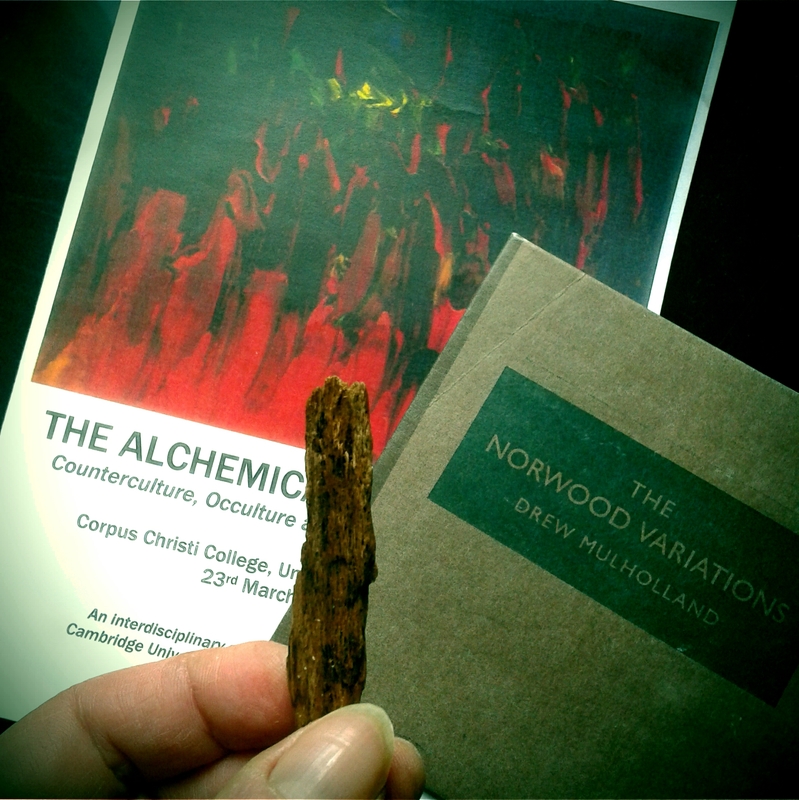 I’m listening to Drew Mulholland‘s lovely cd, The Norwood Variations, as I type. Drew gave me a copy at the symposium, after his talk about tape loops and exploring haunted Glasgow. He also gave me a fragment of wood from the wicker man that was burned in the making of The Wicker Man. He’d brought a box of these fragments with him that he’d plucked from what remained of the iconic structure – just two wooden leg stumps in a field in Scotland. The symposium was organised by James Riley and Evie Salmon, who’re talking of putting on more related events in the future. I hope they do! Peter Stevenson is an illustrator, storyteller, folklorist and musician who’s lived in Wales for most of his life. Who better to curate a three day event bringing together storytellers, artists, musicians and academics, centred around a day long bilingual storytelling of the Four Branches of The Mabinogi. I was invited to showcase my new album ‘Friends and Enemies; Lovers and Strangers’, together with Harriet Earis on harp. Harriet had played on the album, but this would be the first time we’d played the songs live. The thought of playing the songs to an audience familiar with the stories in The Mabinogi was exciting, and I was looking forward to spending a weekend immersed in the stories, meeting people who love them as much as I do. 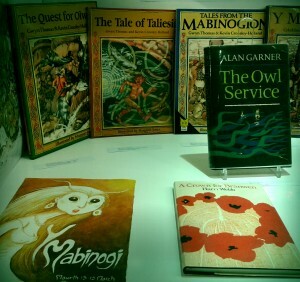 An art exhibition went up in advance of the event, and then a glass case full of different and beautiful editions of The Mabinogion, and related books. After an early morning practice with Harriet on Friday 13th, I headed in to the Arts Centre in Aber to catch some of the symposium taking place that day. 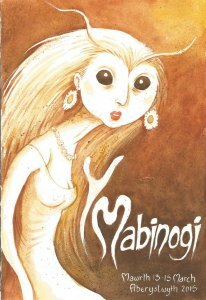 I was glad to hear Sioned Davies’ talk on translating The Mabinogi, and to hear her insist that the stories in the Four Branches were meant to be performed. After our soundcheck, I snuck into the cinema just in time to see Otherworld, an animated film that weaves strands from the Mabinogi in with the stories of three modern day teenagers named ‘Rhiannon’, ‘Lleu’ and ‘Dan’ (short for ‘Manawydan’). It was a good watch, with the added attraction of a soundtrack composed by John Cale. So far so good, but on saturday the real magic happened. We squeezed into the small, round performance theatre to hear storytellers Michael Harvey, Guto Dafis, Dafydd Davies Hughes, Cath Little, Christine Cooper and Fiona Collins tell the Four Branches of The Mabinogi from beginning to end. The storytellers deftly switched from Welsh to English and back again, mirroring the way the action in the stories moves from Wales to Annwn – the Otherworld – and back. Music was used minimally to lend magic to the spell being cast and all the while, artist Maria Hayes was painting. 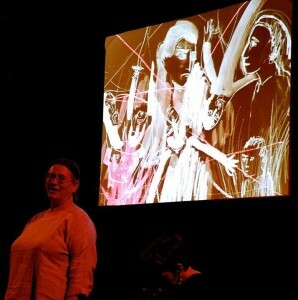 Her paintings evolved and grew as the stories unfolded and they were projected onto a screen behind the storytellers. Photo by Jordan Price Williams. It was a long day – the storytelling started at 11 am and went on till after 8 pm. 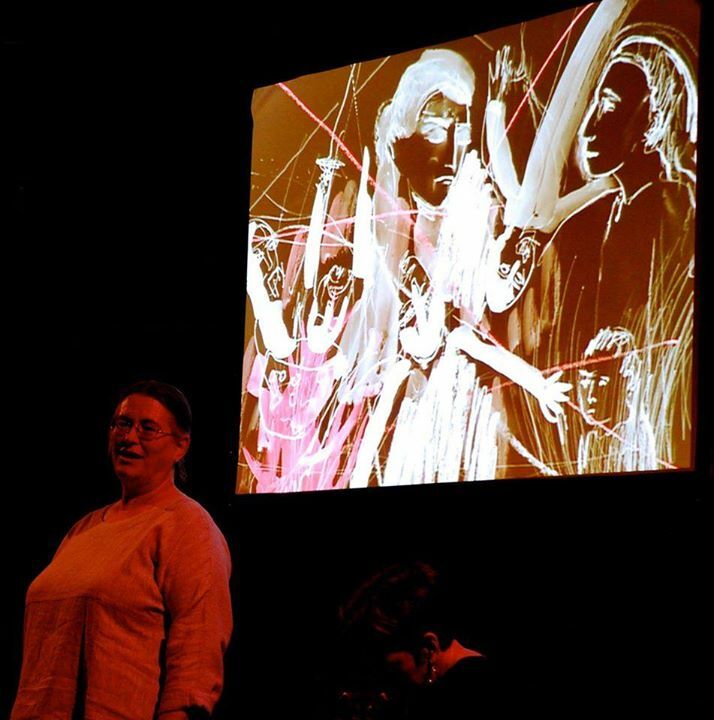 In the hands of these storytellers, Sioned Davies was proved right – these stories are meant to be performed. The performance took us on a magical and moving ride, and by the time Blodeuwedd’s fate was finally sealed and the Fourth Branch came to a close, we seemed to have shared a lifetime with each other. It was an experience I’ll never forget. The release date for my album is May 18th, with pre-orders available from April 13th. I should have copies of the album to sell at gigs from mid-April onwards.